This is a change from Fallout 3 and Fallout: New Vegas. In both cases, the player couldn't continue their game after finishing the main quest line. If you wanted to finish the side quests you missed, you had to reload a save before the final missions. PC gamers could download mods that let them keep playing past the campaign but console owners weren't so lucky. The only way they could keep playing Fallout 3 after the campaign was by purchasing a specific DLC pack that continued their character's story. I understand why Bethesda wouldn't let players continue after the ending of Fallout 3. Without spoiling anything: the player's actions resulted in some sweeping changes to the world. It's a bit jarring to be able to keep playing after the ending and not see the changes mentioned in the epilogue. That said: I don't think players care about that. Yes, it's cool if the game world is different after the ending but it's not expected. Players are mainly looking for an opportunity to finish up side content or play new DLC packs without reverting back to an earlier save. It's expected at this point that open-world games will give players an easy way to continue their adventures. I've played the game for probably 400 hours, and I'm still finding stuff that I haven't seen. He explained that the new building feature is part of the reason for the game's longevity. In addition to being able to craft items as they did in past games, players can now construct their own buildings. They can also outfit them with working electricity, defenses and more. Scavenging items for these structures will take up a good amount of players' time. I wouldn't be surprised if players get lost in this feature and end up building outrageous headquarters for themselves. 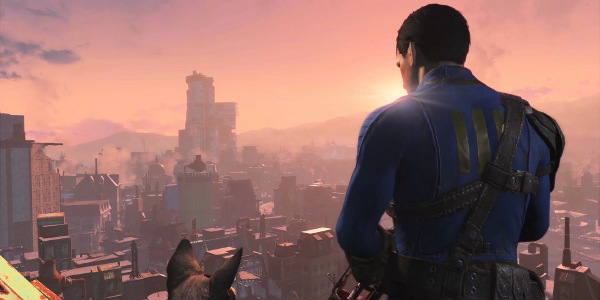 Fallout 4 will be released on PS4, Xbox One and PC on November 10th. The Pip-Boy Edition is already sold out but fortunately there's a way to build your own Pip-Boy.